Potamis Hübner, 1807, Samml. exot. Schmett. 1. Blandin, P. 2007: The systematics of the genus Morpho, Fabricius, 1807 (Lepidoptera Nymphalidae, Morphinae). Hillside Books: Canterbury, United Kingdom. ISBN 978-1-903237-41-6. Lamas, G., 2004: Atlas of Neotropical Lepidoptera'; Checklist: Part 4A; Hesperioidea-Papilionoidea. 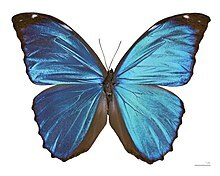 Orfilla, R.N., 1963: Morpho breyeri sp. n. (Lep. Morphidae). Revista de la Sociedad entomológica argentina 26 (1/4): 145–147. This page was last edited on 13 April 2019, at 21:02.